Additional Info: Kivie Cahn-Lipman holds degrees from the Oberlin Conservatory of Music and The Juilliard School, and he is a Doctoral candidate at the University of Cincinnati College-Conservatory of Music. 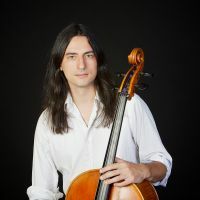 He is the founding cellist of the International Contemporary Ensemble (ICE), and the director of the new period-instrument ensemble ACRONYM. From 2005-2012 he was a Lecturer in Music in a full-time position shared between Mount Holyoke College and Smith College in Western Massachusetts. Kivie has recorded with ICE on the Naxos, New Focus, Bridge, New Amsterdam, Tzadik, Kairos, Mode, and Nonesuch labels. A CD/DVD set of music by Iannis Xenakis on Mode Records will be released in 2013, as will ACRONYM's debut recording of the complete "Alphabet Sonatas" of Johann Christoph Pezel. His first solo CD, the complete cello suites of J.S. Bach, is also anticipated this year. Upcoming recordings in 2014 include the complete viol consort music of David Funck with Consort Conspiracy, a set of previously-unrecorded sonatas by Antonio Bertali with ACRONYM, and a disc of solo cello and chamber music by Kaija Saariaho with members of ICE. As a chamber musician, Kivie has performed in Carnegie Hall's Weill Recital Hall and Zankel Hall, Lincoln Center's Alice Tully Hall and Rose Theatre, and other major venues on three continents, as well as live on WNYC 93.9 in New York and WFMT 98.7 in Chicago. He performs regularly with the Arcadia Players in Northampton, MA, and the Sonnambula Viol Consort in New York City.